Why Are Aren't Advertising Agencies Using Pinterest? - Peter Levitan & Co.
Why Are Aren’t Advertising Agencies Using Pinterest? 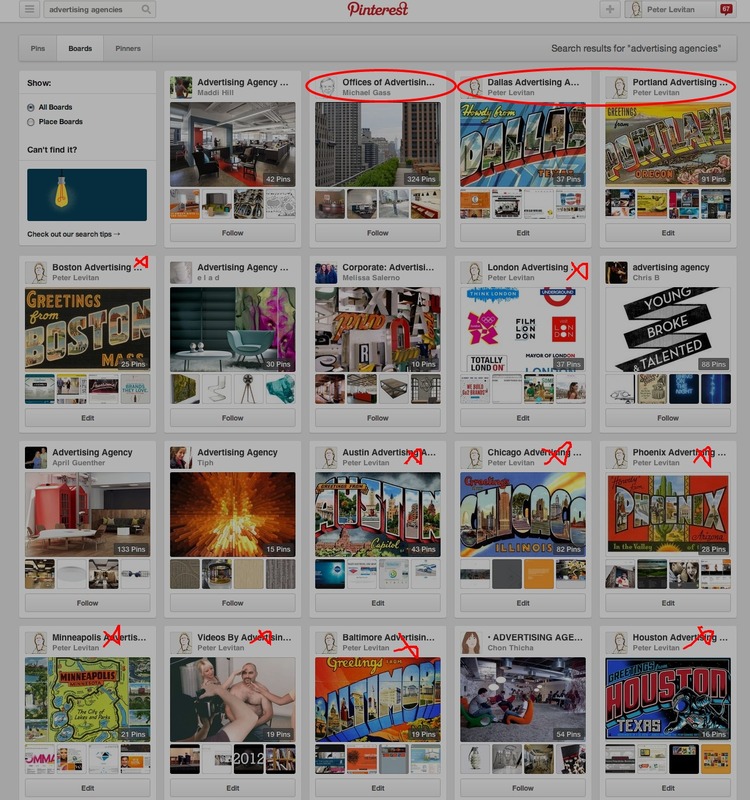 Pinterest just added Guided Search. It makes it easier to find pins and boards on the desktop and in the mobile world. Part of what made the expanded search necessary is the total number of pins on the platform. Silbermann (Ben, the CEO) says that Pinterest users have created 750 million boards, and pinned more than 30 billion items. Those numbers have grown 50% in the last six months alone, he says. OK, zillions of people search Pinterest. Some are your future clients. If so, why are two of the leading results for the term “advertising agencies” advertising agency new business consultants – Michael Gass and me? Shouldn’t it be advertising agencies or the huge networks like WPP or Publicis leading the way? What if a client thinks of using Pinterest to do an agency search? Hint: some are. Take a look below. And, while you are at it, here is a link to my set of Pinterest posts. This entry was posted in Marketing, New Business, Social Media and tagged ad agency, digital marketing, new business, pinterest. Bookmark the permalink. Trackbacks are closed, but you can post a comment.